Have you stored a spare engine balanced on its sump on the corner of your garage, or had difficulty carrying one securely in the boot of your car? If you follow these simple instructions, even the least practical person, should be able to assemble a simple engine stand to enable you to store or transport an engine securely. The only critical dimension is 12” between hole centres on the base. Get that wrong and the studs won’t line up with the holes in the crankcase! Use 20mm square tube for the base members and 8mm studding for the uprights. Cut 2 lengths of tubing or similar about 16” long. Mark at 12” centres centrally on the tube and drill 8mm holes. Cut 4 lengths of 8mm studding about 7” long. 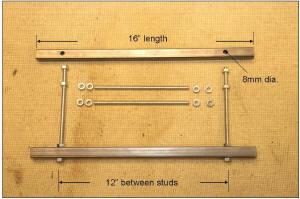 Assemble as shown and securely tighten the nuts either side of the base tube. You now have an engine stand! Mount the engine and tighten the nuts at the top. You can, if you wish, place a large washer above and below the crankcase before mounting the engine and fitting the top nuts. If you have access to welding equipment you can add a pair of crossbars to link the side tubes if you prefer. If you decide to do this mount the engine and then weld the cross bars on to ensure that the mountings are correctly aligned. The materials can be acquired from your local steel stockist, or offcuts from your local engineering workshop. Apologies for the mixed units but Austin Seven engines were made in imperial measurements and steel etc is now in metric dimensions. This article, written by Andrew Jarmin, originally appeared in CA7C Seven Focus March 2013 pp22-23.